Hunted by a shadowy foe in Bloody Mary’s court, Brendan Prescott plunges into London’s treacherous underworld to unravel a dark conspiracy that could make Elizabeth queen—or send her to her death in C.W. Gortner's The Tudor ConspiracyEngland, 1553: Harsh winter encroaches upon the realm. 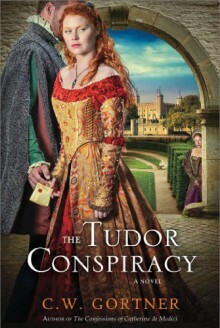 Mary Tudor has become queen to popular acclaim and her enemies are imprisoned in the Tower. But when she’s betrothed to Philip, Catholic prince of Spain, putting her Protestant subjects in peril, rumors of a plot to depose her swirl around the one person whom many consider to be England’s heir and only hope—the queen’s half-sister, Princess Elizabeth. Haunted by his past, Brendan Prescott lives far from the intrigues of court. But his time of refuge comes to an end when his foe and mentor, the spymaster Cecil, brings him disquieting news that sends him on a dangerous mission. Elizabeth is held captive at court, the target of the Spanish ambassador, who seeks her demise. Obliged to return to the palace where he almost lost his life, Brendan finds himself working as a double-agent for Queen Mary herself, who orders Brendan to secure proof that will be his cherished Elizabeth’s undoing. Plunged into a deadly game of cat-and-mouse with a mysterious opponent who hides a terrifying secret, Brendan races against time to retrieve a cache of the princess’s private letters, even as he begins to realize that in this dark world of betrayal and deceit, where power is supreme and sister can turn against sister, nothing—and no one—is what it seems. 3.5A thrill ride of a historical adventure.Review to come as part of the blog tour 7/18!